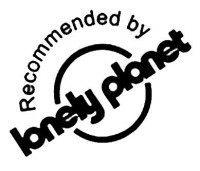 In February 2006, Onca Explorations performed the first whale watching expedition in Mazatlan waters aimed to obtain sightings data and photoidentification records of cetaceans, particularly humpback whales. 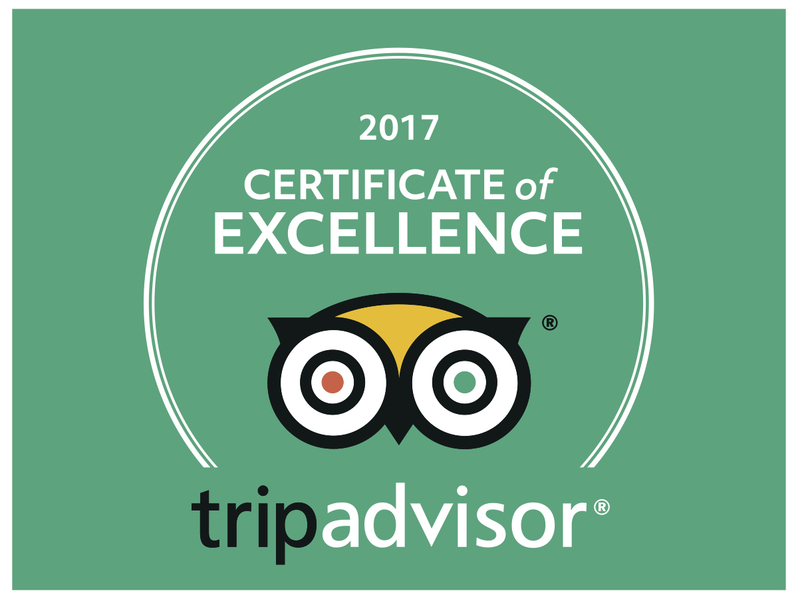 Through the documentation of whale and dolphin sightings during our ecotours, we aim to educate the public about marine ecology, biodiversity and the threats marine life face. 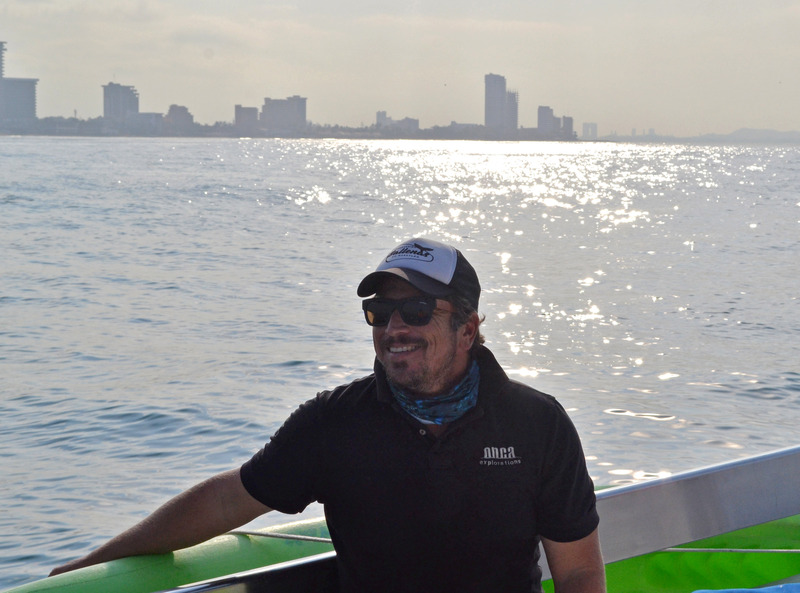 Our citizen science approach to tourism allows us to create a significant base of knowledge that aims to a better understanding of the ecology and conservation needs of the marine megafauna community inhabiting the coastal waters of Mazatlán and southern Sinaloa. Our goal is to better understand trends in distribution, abundance and habitat use by cetaceans and other marine mega fauna in the area in order to assess its management and conservation needs. 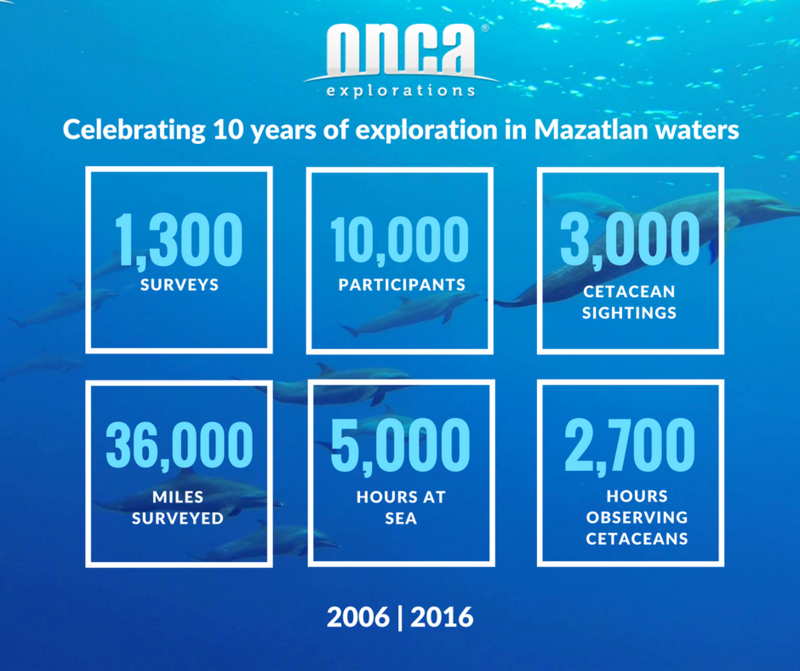 In 2016 we proudly celebrate 10 years of exploration in Mazatlan waters! Throughout an area of over 800 square kilometres on the continental platform of southern Sinaloa, we have performed over 1,300 cetacean surveys funded mainly by tourists and the general public: a bit over 10,000 participants to be precise! During over 5,000 hours at sea we have surveyed 36,000 linear nautical miles – that is like circling the globe around the equator 1.5 times!- and documented over 3,000 marine wildlife sightings, including up to up to 19 species of marine mammals, and a little bit over 2,700 hours observing cetaceans. Our citizen science expeditions offer the opportunity for everyone to live a unique experience in nature while taking part in real wildlife monitoring programs along a team of specialists who act as guides and share their knowledge over ecosystems visited, species observed, techniques used in their study, and the importance of managing and conserving their populations. Oscar Guzón Zatarain, M.Sc.| Founder and director. By taking photographs of natural markings, like nicks and scars on the dorsal fins of dolphins,or the pigmentation pattern on the ventral zone of humpback whale flukes; cetaceans can be identified to the individual level, in the same way fingerprints are used on humans. By building Photo-identification catalogues, comparing them with those collected for other geographic regions, and applying specific analysis to our data, we can begin to better understand the dynamic lives ofwhales and dolphins, including movement patterns, frequency and duration of their associations, patterns of residency and their total abundance in the study area. 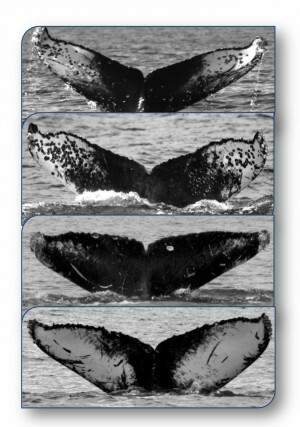 Up to date, our humpback whale catalogue includes the fluke photographs of over 1,500 individual whales! The analysis and shared use of these data sets is crucial in decision making for the development of proper conservation and management programs for this species in Mexico. Apart from humpbacks we curate PhotoID catalogues for other species like theBryde´s whale (Balaenoptera edeni), Orcas (Orcinus orca), Bottlenose dolphins (Tursiops truncatus) and Spotted dolphins (Stella attenuata).